Unless you’ve been avoiding the internet for fear of Avengers spoilers, you may have noticed that everyone’s favourite star-tracker, Gaia, has recently released its second catalogue containing the precise location of around 1.7 billion stars in our own galaxy and beyond. Until now, we only had access to around 250 white dwarf stars in our local galaxy, making it difficult to look for common properties and understand the population as a whole. But, thanks to Gaia, today’s authors had a sample of almost 14,000 white dwarf stars to play with – here’s what they discovered. Ambitious in its ultimate goal, ESA’s Gaia space telescope aims to make the ultimate 3-dimensional map of our Milky Way from observing a small fraction (~1%) of its constituent stars. Throughout its five-year mission, Gaia is carefully monitoring the precise position of over a billion stars, whilst also having the photometric capabilities to determine the brightness of a star as a function of colour. This is important as the colour of a star informs astronomers its age and temperature. Devised in the early 20th century, this colour-magnitude information is often summarised in a Hertzsprung-Russell diagram which is shown in Figure 2. Alongside regions like the main sequence, where most ordinary stars like our Sun sit, and the giant branch, containing (yes, you guessed it) the giant stars; we have a smaller population of stars known as white dwarfs. A white dwarf is a dense stellar core which is left behind when a medium-mass star, between 0.5-8 times the mass of the Sun, ends its life. 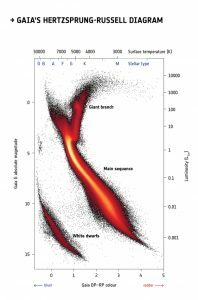 The Hertzsprung-Russell diagram summarising the new Gaia data is particularly exciting for white dwarf enthusiasts everywhere because it is direct evidence for something not previously observed – two distinct populations of white dwarfs. Such grouping is known as bifurcation and is clearly evident in Figure 2 (if you open up the picture in a new window and zoom in). However, the authors have gone further than just pointing this out, they’ve recreated it using models. Two main differences observed in the properties of white dwarfs are determined by whether it has a hydrogen-rich, or helium-rich atmosphere, where hydrogen-rich white dwarfs are redder than their helium-rich counterparts. Thus, the authors also investigated whether this could explain the bifurcation. Figure 3: The observed (left panel) and simulated colour-magnitude diagrams created to verify if the atmosphere being hydrogen or helium-rich was responsible for bifurcation. TL:DR – it’s not. Figure 3 from paper. Although close inspection of Figure 3, which compares the observed colour-magnitude diagram from Gaia (Figure 3, panel 1) to simulations (Figure 3, panels 2 & 3), reveals slight bifurcation in the simulated population of stars formed via single burst of star formation (Figure 3, panel 3), it isn’t distinctive enough to stay once added to the simulated population of stars formed at a constant rate (Figure 3, panel 2). So, the atmospheric composition does not lead to the bifurcation of white dwarf stars….but what about mass? Dubbed the Gaia model, the authors derive the mass distribution of a subset of their 14,000 white dwarfs using the Gaia data to predict what colour the white dwarfs should be if observed by the Sloan Digital Sky Survey (SDSS). A second model, called the disc model, is formed from the synthetic white dwarf created earlier. 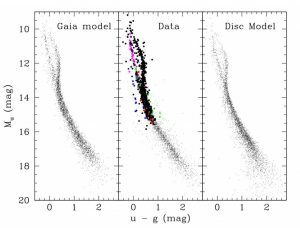 To look for similarities between the Gaia and disc model in real SDSS data, the authors randomly sample each data set and create another colour-magnitude plot. What is clear from Figure 4 is that the data and model match up really well, and bifurcation can be explained by white dwarfs having different masses…but why haven’t we observed this before now in our SDSS data? 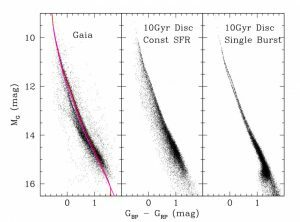 There are several reasons, but the first stems from the fact due to large errors in the SDSS survey, we did not have precise enough photometry to see mass bifurcation predicted by the Gaia model. 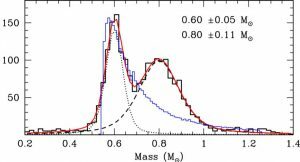 The missing mass bifurcation of previous observations becomes more apparent when we investigate the mass distribution of Gaia white dwarfs. Figure 5 highlights two groups of white dwarfs, low-mass at around 0.5 solar masses, and high-mass white dwarfs at 0.7 solar masses. Figure 5: The mass distribution of the Gaia white dwarfs – there are clearly two groups of white dwarfs here. The red line indicates the best fit data required to estimate what the SDSS magnitude should be. The bottom half of Figure 5 from paper. The second peak in this plot, the high-mass peak, is particularly interesting because for white dwarfs to be that heavy, they have to have formed via the merging of two nearby white dwarfs. The number of stars in the merger peak also match up to previous predictions for the number of white dwarfs that form through mergers. However, these more massive white dwarfs are intrinsically dimmer than their lighter counterparts, meaning most surveys will be biased towards observing the lighter, brighter white dwarfs and the numbers of previously known massive white dwarfs will be reduced as a consequence. So, it’s been exactly a month since the second Gaia catalogue was released and we have already learned a tremendous amount about a small population of stars within our galaxy, by increasing our white dwarf catalogue from 250 objects to almost 14,000. 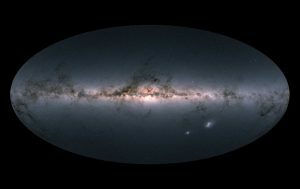 With its unique and extensive data set, it’s hard to predict what astronomers will uncover next, but clearly, the Gaia dataset will be revealing the secrets of the (local) universe for years to come. That’s pretty neat. What makes the more massive white dwarfs intrinsically dimmer? I’m trying to figure out how that would work. In the catalogues of white dwarfs from the Sloan Digital Sky Survey, there are more than 19 thousand white dwarfs published, but most of them much farther than the 250 in the 25 parsec sample. More massive white dwarfs are smaller and therefore fainter.